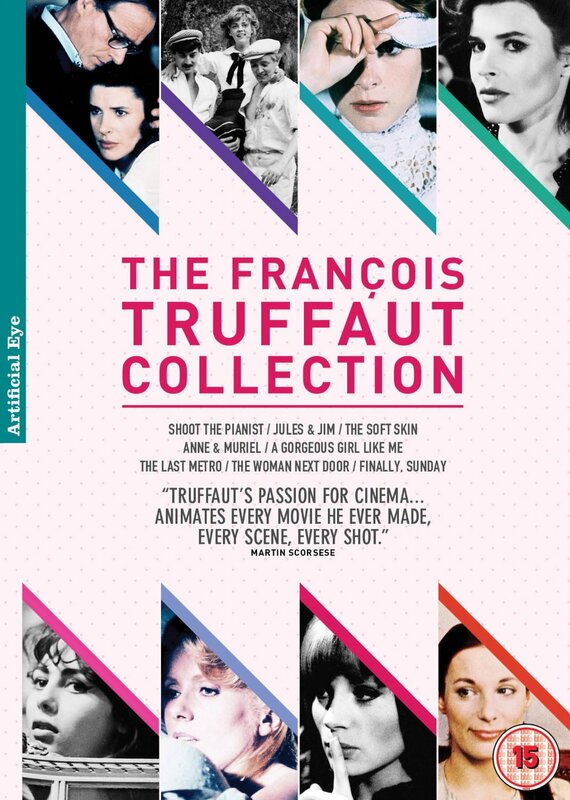 Collection of eight films directed by François Truffaut. In 'Shoot the Pianist' (1960), Charles Aznavour stars as a famous concert pianist who leaves his former life behind to play in a sleazy Parisian bar where he gradually becomes involved in the criminal activities of the big-city underworld. 'Jules et Jim' (1962) takes place over 20 years, both before and after World War I. Jeanne Moreau stars as Catherine, the beautiful and unpredictable woman who maintains a delicate relationship with two friends, the quiet German Jules (Oskar Werner) and the romantic Parisian Jim (Henri Serre). The war intervenes and drives the men to the opposing fronts; afterwards, the two quickly resume their friendship, but the balance of their relationship with Catherine is now upset by more adult concerns. In 'The Soft Skin' (1964), Jean Desailly stars as Pierre Lachenay, a successful middle-aged novelist and broadcaster who begins an affair with Nicole (Francoise Dorleac), a pretty young air hostess he meets on a flight to Lisbon while en route to deliver a lecture. Despite having little in common with Nicole, Pierre is enraptured and continues the affair on his return to France. But when his wife Franca (Nelly Benedetti) discovers his infidelity, she becomes consumed with a desire for revenge, and a tragic denouement unfolds. 'Anne and Muriel' (1971), set in nineteenth century Wales, follows Claude (Jean-Pierre Léaud), an aspiring young French writer, who spends a holiday on the Welsh coast with an English family and falls in love with the two daughters, Ann (Kika Markham) and Muriel (Stacey Tendeter). 'A Gorgeous Girl Like Me' (1972) follows Stanislas Prévine (André Dussollier), a sociologist, who, while researching a book, interviews murderess Camille (Bernadette Lafont), who tells him the story of her life. Put in a reform school as a child for suspected patricide, and later transferred to an orphanage, Camille escaped and tricked a young man called Clovis (Philippe Leotard) into marrying her. After attempting to kill Clovis' mother (Gilberte Geniat), she fled to Paris, where she began an affair with a night-club singer. Camille has left a trail of destruction and deceit in her wake, which now threatens to engulf Stanislas... In 'The Last Metro' (1980), the year is 1942, and Paris is occupied by German forces. Jewish theatre owner Lucas Steiner (Heinz Bennent) has handed over the control of his theatre to his actress wife Marion (Catherine Deneuve) while he hides out in the cellar. During rehearsals for the next production, the presence of a womanising actor (Gérard Depardieu) and a Nazi-sympathising journalist cause many difficulties for Marion. Eventually, she is forced to decide between her loyalty to her husband and her love for her countrymen, and acts out her solution in the production she has been rehearsing. In 'The Woman Next Door' (1981), the ghost of a tempestuous affair is reawakened when the two lovers, estranged for 10 years and now both newly married, coincidentally move next door to each other. In 'Finally Sunday' (1983), a company boss is accused of murdering his wife and her lover, and the evidence seems to support this. Whilst he is hiding from the police, his secretary takes on the role of detective and she uncovers illicit love affairs, prostitution rings and skeletons in everyone's closets before she uncovers the real culprit. Collection of eight films directed by François Truffaut. In 'Shoot the Pianist' (1960), Charles Aznavour stars as a famous concert pianist who leaves his former life behind to play in a sleazy Parisian bar where he gradually becomes involved in the criminal activities of the big-city underworld. 'Jules et Jim' (1962) takes place over 20 years, both before and after World War I. Jeanne Moreau stars as Catherine, the beautiful and unpredictable woman who maintains a delicate relationship with two friends, the quiet German Jules (Oskar Werner) and the romantic Parisian Jim (Henri Serre). The war intervenes and drives the men to the opposing fronts; afterwards, the two quickly resume their friendship, but the balance of their relationship with Catherine is now upset by more adult concerns. In 'The Soft Skin' (1964), Jean Desailly stars as Pierre Lachenay, a successful middle-aged novelist and broadcaster who begins an affair with Nicole (Francoise Dorleac), a pretty young air hostess he meets on a flight to Lisbon while en route to deliver a lecture. Despite having little in common with Nicole, Pierre is enraptured and continues the affair on his return to France. But when his wife Franca (Nelly Benedetti) discovers his infidelity, she becomes consumed with a desire for revenge, and a tragic denouement unfolds. 'Anne and Muriel' (1971), set in nineteenth century Wales, follows Claude (Jean-Pierre Léaud), an aspiring young French writer, who spends a holiday on the Welsh coast with an English family and falls in love with the two daughters, Ann (Kika Markham) and Muriel (Stacey Tendeter). 'A Gorgeous Girl Like Me' (1972) follows Stanislas Prévine (André Dussollier), a sociologist, who, while researching a book, interviews murderess Camille (Bernadette Lafont), who tells him the story of her life. Put in a reform school as a child for suspected patricide, and later transferred to an orphanage, Camille escaped and tricked a young man called Clovis (Philippe Leotard) into marrying her. After attempting to kill Clovis' mother (Gilberte Geniat), she fled to Paris, where she began an affair with a night-club singer. Camille has left a trail of destruction and deceit in her wake, which now threatens to engulf Stanislas... In 'The Last Metro' (1980), the year is 1942, and Paris is occupied by German forces. Jewish theatre owner Lucas Steiner (Heinz Bennent) has handed over the control of his theatre to his actress wife Marion (Catherine Deneuve) while he hides out in the cellar. During rehearsals for the next production, the presence of a womanising actor (Gérard Depardieu) and a Nazi-sympathising journalist cause many difficulties for Marion. Eventually, she is forced to decide between her loyalty to her husband and her love for her countrymen, and acts out her solution in the production she has been rehearsing. In 'The Woman Next Door' (1981), the ghost of a tempestuous affair is reawakened when the two lovers, estranged for 10 years and now both newly married, coincidentally move next door to each other. In 'Finally Sunday' (1983), a company boss is accused of murdering his wife and her lover, and the evidence seems to support this. Whilst he is hiding from the police, his secretary takes on the role of detective and she uncovers illicit love affairs, prostitution rings and skeletons in everyone's closets before she uncovers the real culprit.